11pm [Yesterday] - All day long, I was mostly asleep in the La-Z-Boy. This kind of thing is NOT like me. Usually I am doing things, all day long. My iPhone just dinged me that it was time for bed. So I woke up. I had been in the La-Z-Boy since sundown! What is going on? Maybe side effects of Cephaexin? No, that's not it? I read all about those side-effects and making a person drowsy was not one of them. Here are some stuff you may enjoy hearing about our Baby Boid. Baby Boid loves music. 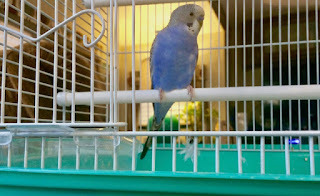 When I put iPhone near his cage and play songs, he begins to make tiny sounds. Not chirping. Maybe his sounds are Boid trying to imitate what he hears. Right now, he is making sounds of Pavarotti singing Nessun Dorma. Now that, would be something else! It is becoming clear that Boid needs a gentle push to get him to accept me as his playmate. Having me as his playmate is very important for Boid. Otherwise, he will have a very boring life. Playing is a very big part of a parakeet's life. Boid is not afraid of my hand anymore. 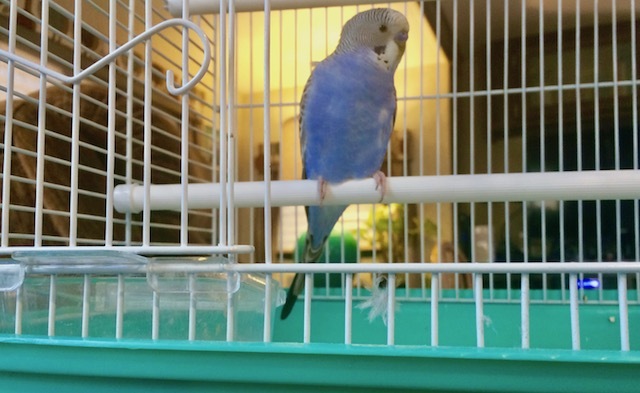 Boid lets me pet his blue chest with my finger. But only when he is inside his cage. Boid somehow, separates being inside his cage with being outside. I must begin again, getting Boid to adapt by using his seeds. Once Boid accepts to eating his seeds from my hand, the rest will come fast. But our list is not for Santa. It's for tweaking Little Scampy! Curtain rods. Scampy's quality deserves quality curtain rods. Present rods have weak hangers. We are shopping on the net for new ones. George is sewing up Scampy's new curtains. They are stealth-black. Range Top needs engineering change. Stud rising up thru top instead of screw going down. A thing to hold shampoo in Scampy's shower. Replace Scampy's porch lite which burned out. PS: Looks like the replacement for the busted trailer hitch will be installed this coming Friday. 4:30pm - Which is best for this retired guy? Kicking back and doing less stuff? I am very competent to answer this question. Not for you! For myself. You must come up with your own answers. Well, here's the thing. The older I get, the harder it becomes to do stuff. Would I give up doing because it's harder now? No-sir-eeee! It's just too much fun. Especially now because I am my own person. No job to go to. I seem to have enough $dough$. Take right now, for example. The doctor tells me that I likely got bursitis from banging my elbow into things. While my elbow heals, I have to cool down activities. No way around that. Bursitis and the medication that I am taking for it, requires that I sit in the La-Z-Boy a lot. Low energy is the reason. But I know, full-well, that soon the bursitis will heal, and I will back on top again. Got to get some protection for my elbows though. Are there such a thing in sports as "elbow guards?" If you have followed my blog for awhile, you know that after my 2014 heart attack, I stopped RVing for over two years. Now I am back. And own two RVs to prove it! What would it take to stop me from RVing? I do not consider that kind of question a good idea. My kind of thinking has only positive aspects. You got a lazboy? Lucky man! My favorite feature of them is the lock feature that allows you to stay reclined in a fixed position of your choosing. You may pleased to now know, that MY La-Z-Boy locks in ANY position. It's electric. Maybe your body is just enjoying doing nothing for a bit. You've been really busy lately. You mean my young, gorgeous, youthful and healthy body? That body that is the envy of all who gaze upon it? That body that goes.....without stopping? PS: What month do you return to Las Vegas? Hmmm. George, me think you might have a wee bit of a spammer hitting your blog, whatta ya think? Very imaginative. But, poor writing skills. Funny thing though. As I was re-reading the poor darling's sad story of woe, her comment suddenly and without warning went...pooooof!...and was gone! Careful George, she may put a "spell" on you!!! I like doing both. I do things around the house to keep me moving, go on camping trips (tent style...no comfy RV for me! ), hike a lot. I love the out door life. However, I do love to get in the morning and leisurely sip on my coffee in pjs, watch the news, DIY, cooking channels and I love the science channels too. BTW you might have bruised your elbow, which turned to bursitis, when you fell last week and rolled next to Honda...remember the bad came in sixes? About bad things come in [some number]. I don't really believe in bad/good things. They are all just things.To be dealt with in a positive way. Do you really believe that my bad things are continuous? As long as you can be honest with yourself about limitations, you should do whatever you want. We were a JoJoba for a tour last year, I've got my fingers crossed you'll get in soon. It's a great community! I agree. And I believe that I am honest to myself about my limitations. About Jojoba. Yesterday I phoned up to get my waiting list number. It is #24. When I first got on the waiting list, I was #34. A month later, it was #24. Nothing happened for this current month. No movement. George darling ... remember how you changed your eating habits and how it paid off with weight loss? Next habit to go after, me thinks, is your activities habit. In other words, you must learn to listen carefully to your body and, based on that listening, learn to pace yourself. I speak from personal experience here. Others might want to chime in. I really believe that I do pay very close attention to how I feel [my condition] before I do something. With that said, however, I do not make want to make broad decisions about my activities. For example: It was an error of mine, after my heart attack, to make a decision to not RV anymore. Fortunately, I came to my senses and here I am being an RVer again!